Why Should a patient visit NABH Accredited Dental Clinic? Every prospect of healthcare industry be it internally (doctor, clinical and non-clinical staff), or externally (patient) wants to ensure that they must be a part of an Institution which is acknowledged for the quality and high standard of services. Nowadays we can find numerous dental care services which offer the same treatment. Therefore, with so many Dental Care hospitals in Karnataka offering several dental care services, why you should choose us? 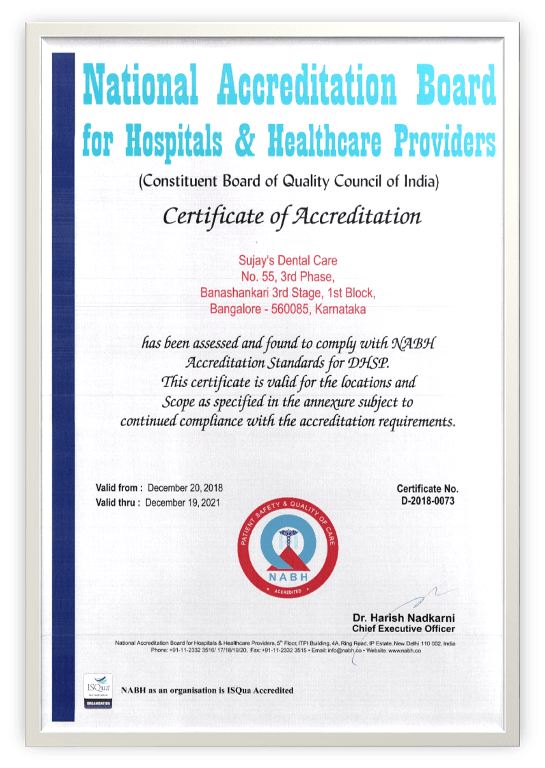 Sujay’s Dental care has received the most prominent recognition from National Accreditation Board of Hospitals and Healthcare (NABH), a constituent board of Quality Council of India, New Delhi, for its quality and high standard services. Being Karnataka’s 1st NABH Accredited Dental Clinic, we have adhered to the benchmarks established by NABH for the progress of the healthcare industry and providing the high standard services to the patient. The commitment which we provide in implementing and following the strict list of over 600 distinct elements is what makes our dental clinic different from others. Here you will find the guaranteed quality of care and safety for each and every patient. Back in 2006, the National Accreditation Board of Hospitals and Healthcare (NABH) was founded by the Government of India as a constituent of Quality Council of India (QCI) with a vision to ensure the quality of services and safety in the healthcare industry in India. It is best described as a benchmark for excellence in healthcare. In addition to that, the primarymotive of NABH was to establish a standard for the progress of the healthcare industry. High standard quality care and safety is the key element of NABH, and in order to get NABH accreditation, a hospital needs to meet and implement an exhaustive healthcare standard. A standard which has a strict list of over 600 elements designed by NABH which are divided between patient-centered standards and organization centered standards. NABH is based on clear and transparent policies and protocols for the quality care of patients throughout the process. It focuses on entire operations of a hospital from registration, admission, pre-surgery, peri-surgery and post-surgery protocols, discharge from the hospital to follow up with the hospital after discharge. A group of people comes for assessment, and they make sure that all parameters are working efficiently and effectively. The objective of NABH is to provide accreditation of healthcare facilities, Quality promotions such as nursing excellence, laboratory certification programs, etc., IEC activities, for instance, public lecture, advertisement, workshops, Education and Training for Quality & Patient Safety, and Endorsement of various healthcare quality courses or workshops. In a nutshell, the primary objective of NABH is enhancing health system & promoting continuous quality improvement and patient safety. NABH has extended its accreditation activities outside India under NABH International (NABHI) in July 2010 to enhance health system, patient safety, and promoting continuous quality improvement at the International level primarily to support SAARC countries. For NABH, patient safety and quality of care are very important, and they are the biggest beneficiary. Getting NABH Accreditation itself results in high quality of care and safety at the hospitals. Patients are treated by well-qualified, trained and credentialed medical and non-medical staffs. Patient’s rights are respected and protected. In order to provide safe healthcare, all equipment regularly maintained and measured to ensure that they give accurate results. They always monitor and evaluate the patient’s satisfaction, resulting in better services. NABH accredited hospital provides continuous learning, good working environment, leadership, and most important ownership of clinical process which creates a satisfaction among the staffs. Furthermore, this leads to the professional development of Clinicians and Paramedical staffs. NABH regularly offers constant support and training to accredited organizations. Accreditation hospital focuses on continuous improvement. This continuous process of NABH accredited helps hospital management to check on their services and help them to improve quality as needed. It gives an opportunity to the healthcare unit to benchmark with the best. NABH also offers a structure to make a plan and improve quality continuously. Lastly, The accredited hospital also provides an objective system of the empanelment by insurance and third parties. It brings transparency and helps in providing reliable and certified information on medical facilities, infrastructure, and level of care. The first edition of standards was released in 2006, and then in every three years, it has been revised. The latest one which was 4th edition was released in 2015. The standards provide a framework of quality assurance and improvements for hospitals. Presently NABH is offering accreditation programs for hospital, small health care organization/daycare centers, Blood Bank and Transfusion Services, Community health center and Primary health center, Oral Substitution Therapy (OST) centers, Dental centers, and wellness centers.